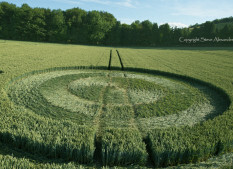 This really is a very pretty location for a crop circle. 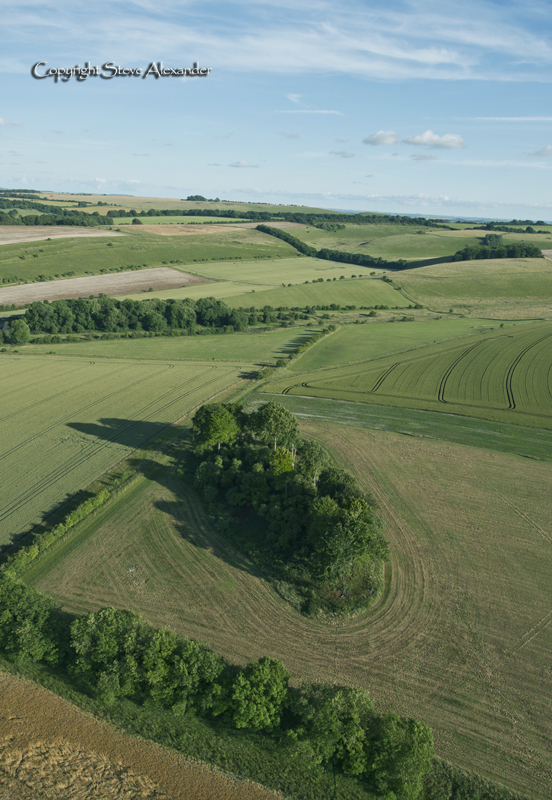 Langdean Bottom (as it name suggests) is nestled in the bottom of a natural valley close to the village of East Kennet in Wiltshire. 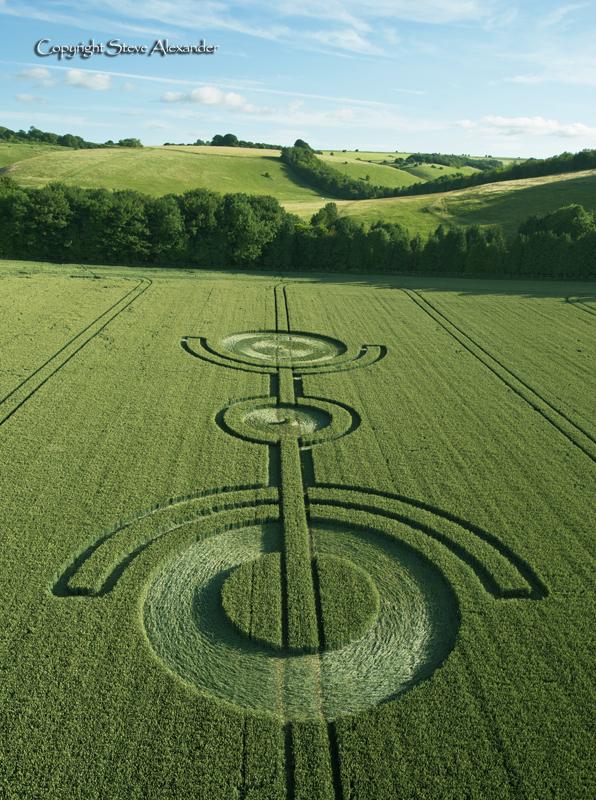 The ancient ridgeway pathway runs alongside this field and the landscape nearby is dotted with roundbarrows. 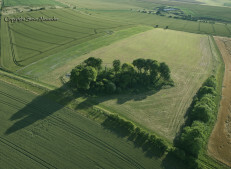 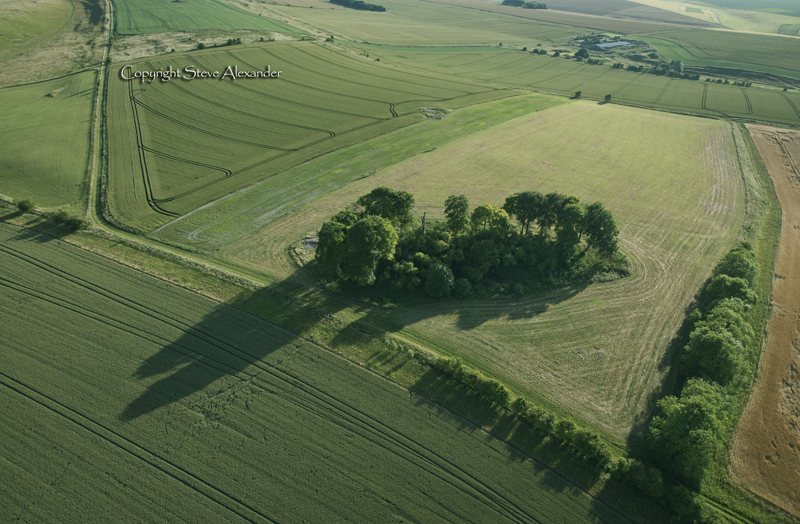 Clearly visible from the air is nearby East Kennet long barrow. 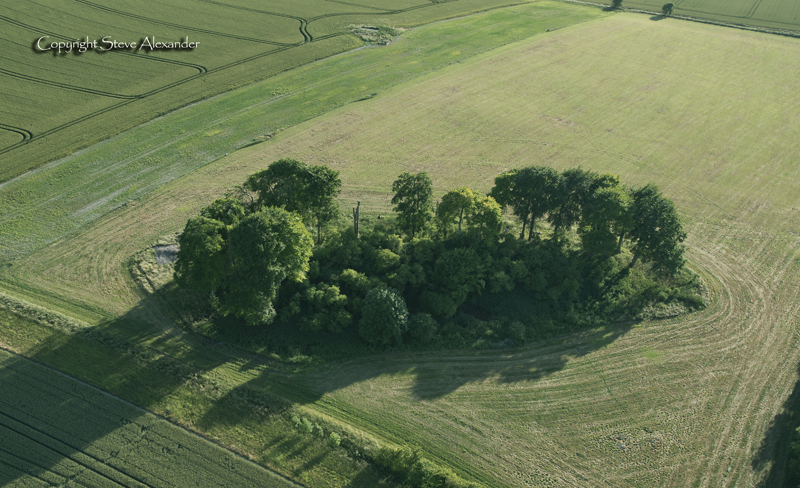 Unlike its sibling at West Kennet, this longbarrow remains un-excavated and it’s stones mostly covered by a large earthen mound and a copse of large trees stands on top. 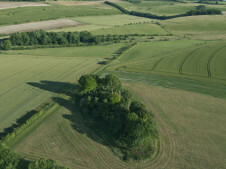 The longbarrow is on private land and so there is no official public access – but good views can be had from the nearby Ridgeway path. 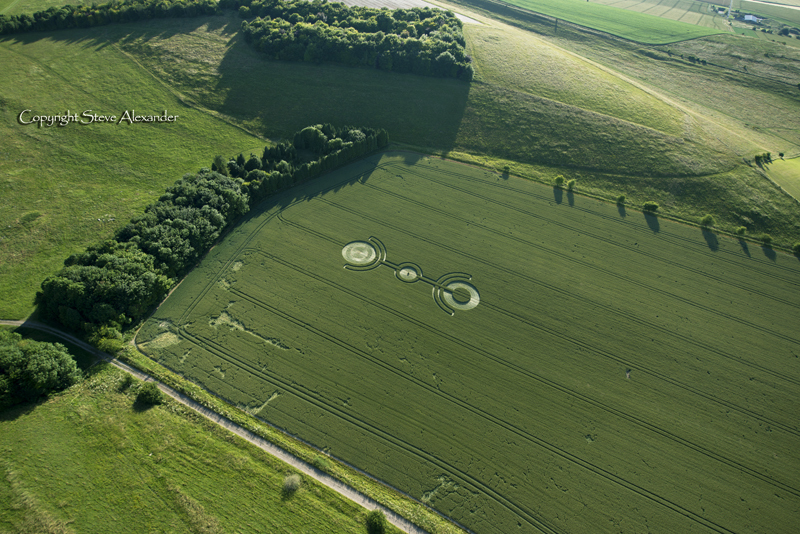 You can read more about East Kennet long barrow here and here. 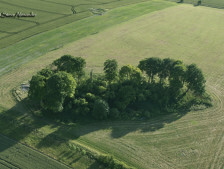 As you can see in some of the pictures below, the field is terminated at one end by a row of trees, on the other side of the trees is the remains of an old stone circle (or perhaps hut circle) – some of the stones can still be seen in the grass. 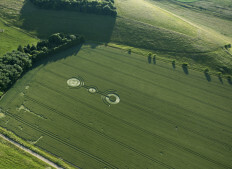 You can read more about the site here and see pictures of the stones in situ. 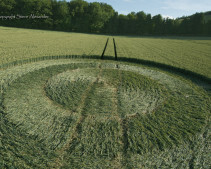 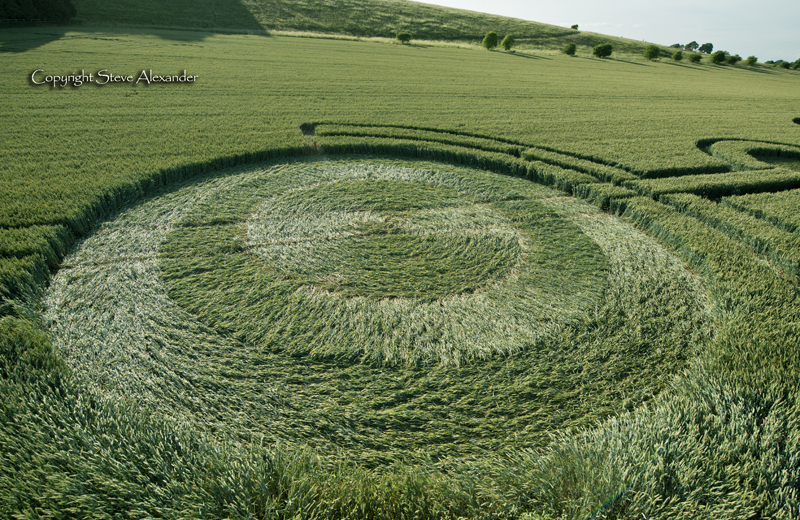 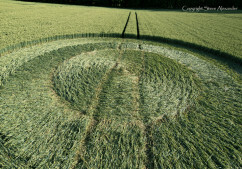 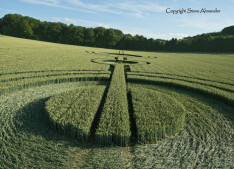 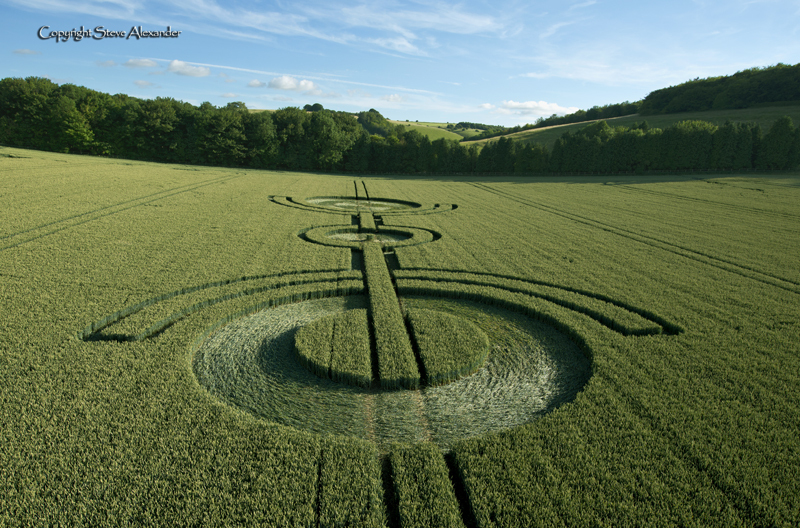 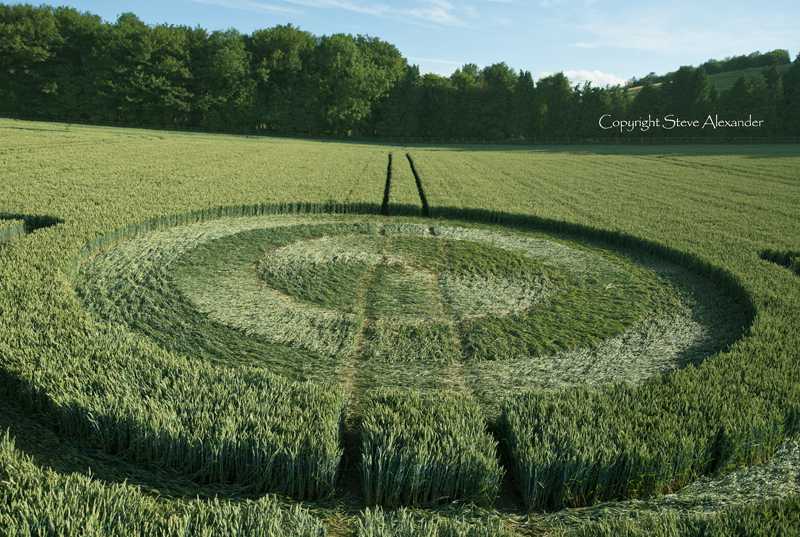 This crop circle has held up very well, it appeared on the 26th of June, but we did not photograph it until the 3rd of July due to a bout of particularly bad weather. 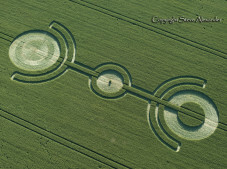 However, it still looked crisp and the beautiful floor lay of the formation still looked impressive and intact. 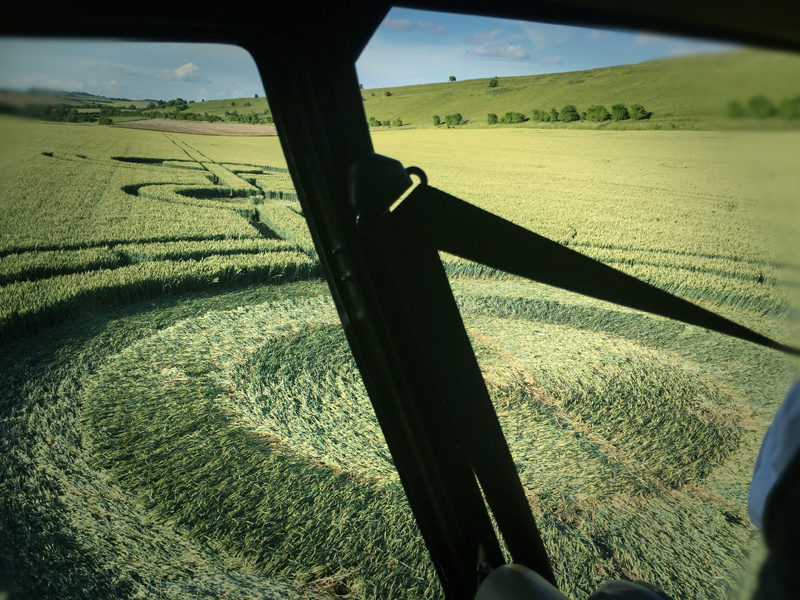 Clearly there had been animals in the crop (probably deer) as there were marks all over the field, but the tracks were fine and meandering rather than those you expect to see from careless human visitors. 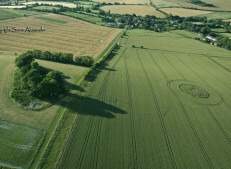 There is no official permission to visit this circle as far as we are aware, but views might be had from the nearby White Horse trail, Ridgeway path and Wansdyke which allows walkers access to nearby Thorn Hill and Lurkerly Hill. 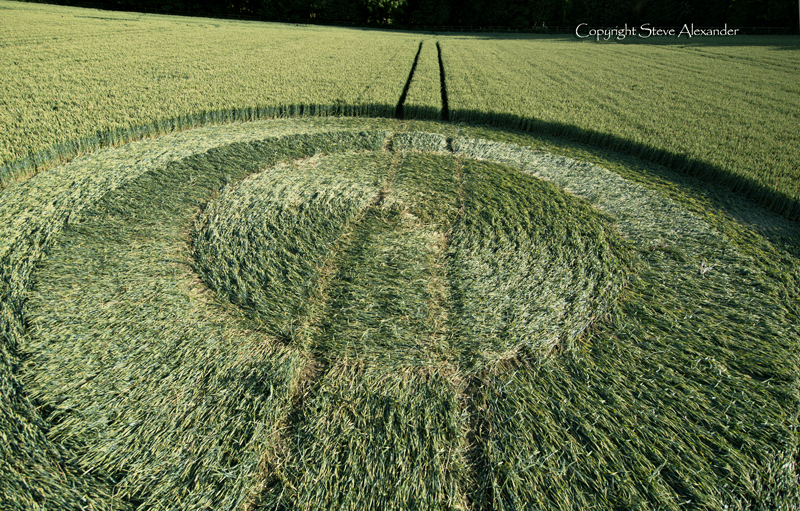 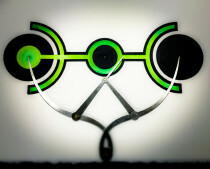 The design itself is very reminiscent of crop circles in their early years. 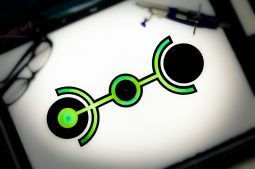 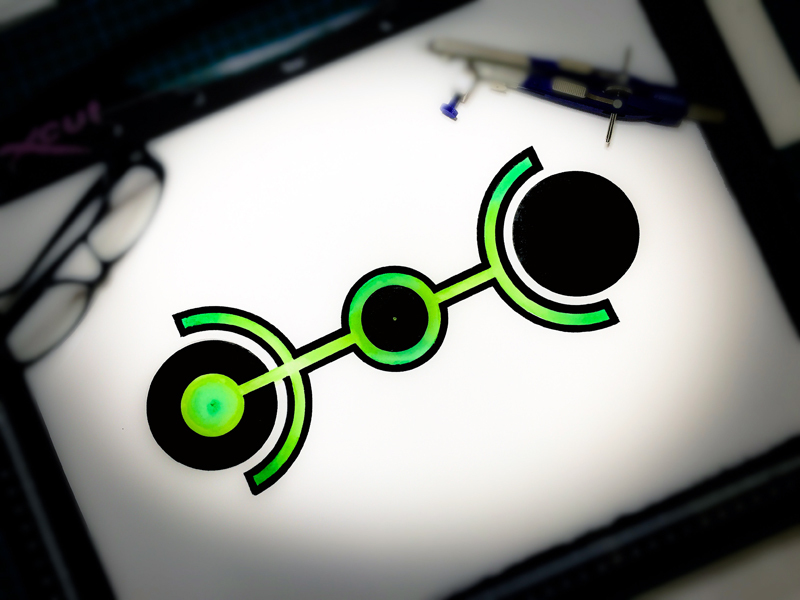 Circles connected by lines – so-called Pictograms. 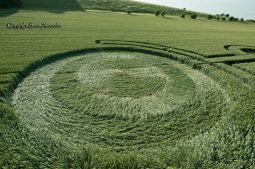 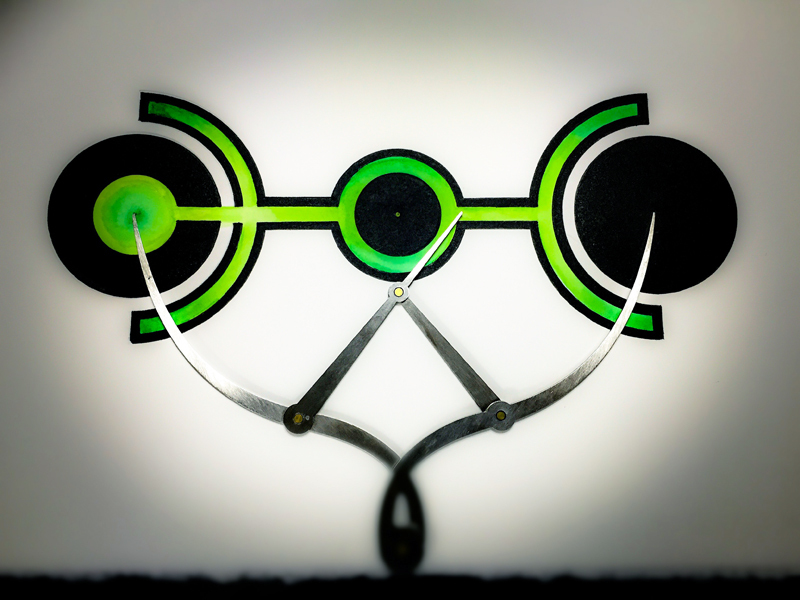 But it is also very similar in style to several circles that have appeared this year in that it has a narrow standing band which emphasises the design – we’ve seen this at Cherhill 2017 and Milk Hill 2017. 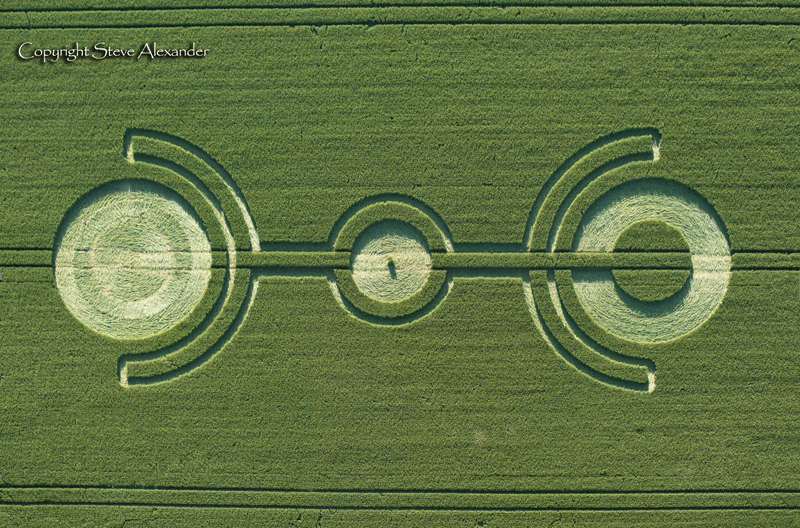 The semi-circles which underline the circles at each end are a rather nice feature – researcher and geometer Michael Glickman calls them ‘cradles’ – again rather nice. 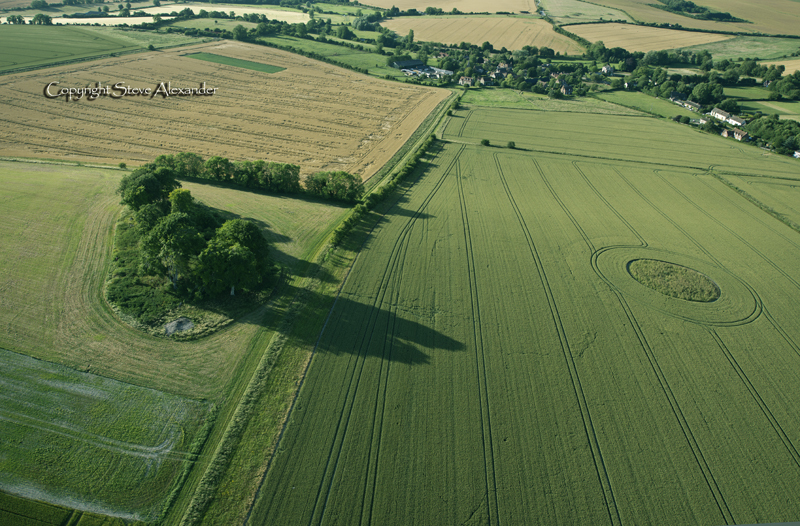 The circle at the southern end of the formation contains a beautiful floor lay with a centrally swirled centre, then a radially laid ring and then a further swirled ring – in the early evening sun it looked stunning. 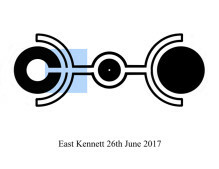 See below in the Geometry Gallery form more commentary on the design. 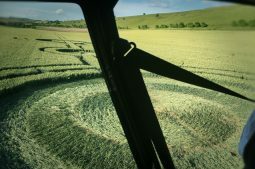 The geometry and design of this circle presented one major problem for those of us who like to draw the circles and that was the placement of the formation in relation to the tractor-lines in the field. 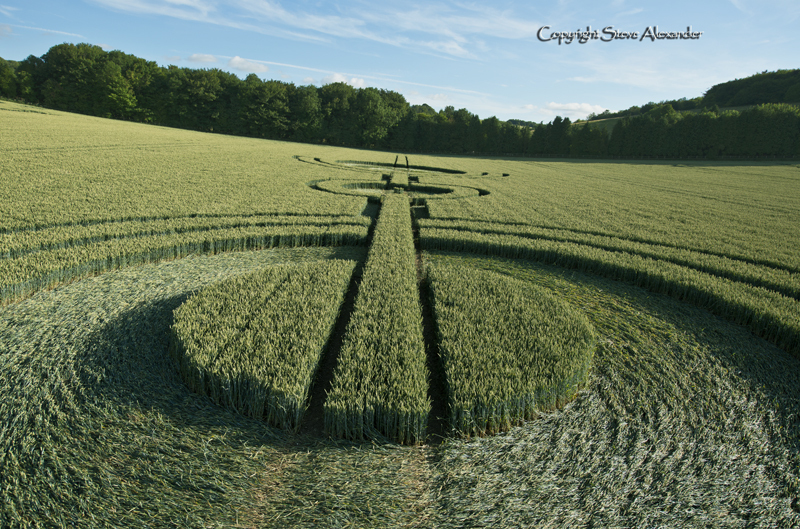 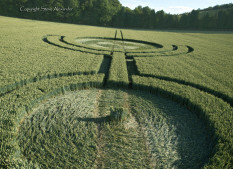 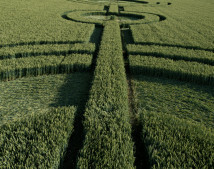 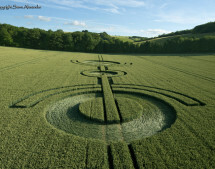 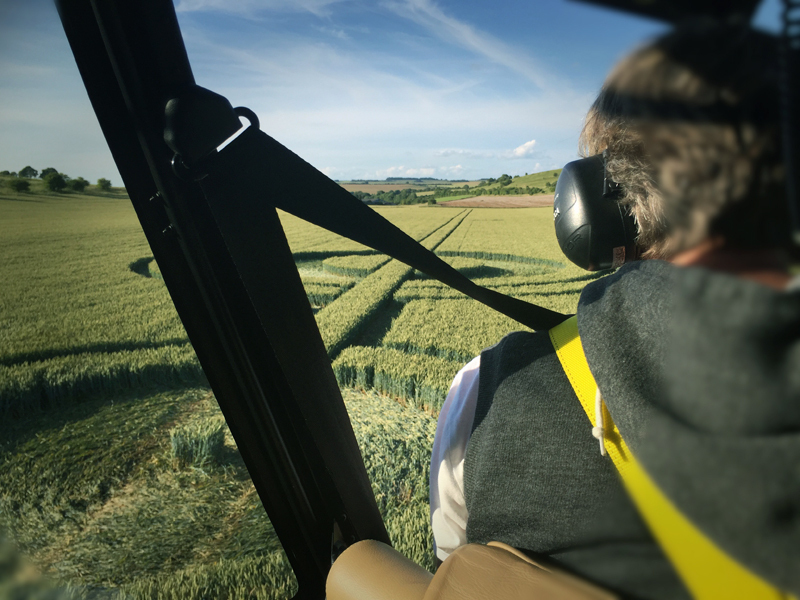 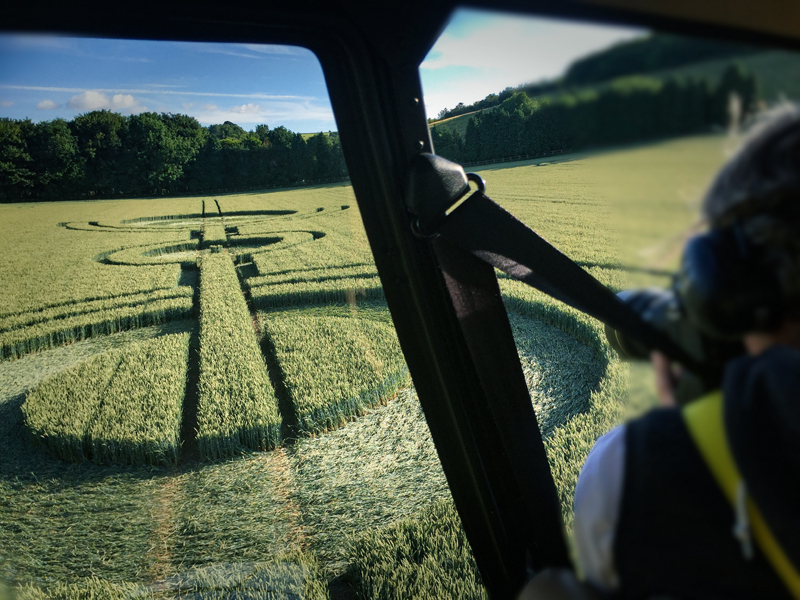 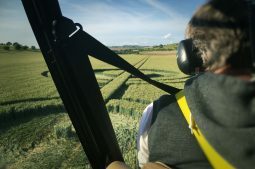 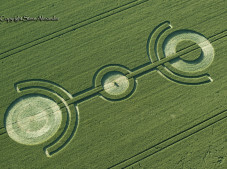 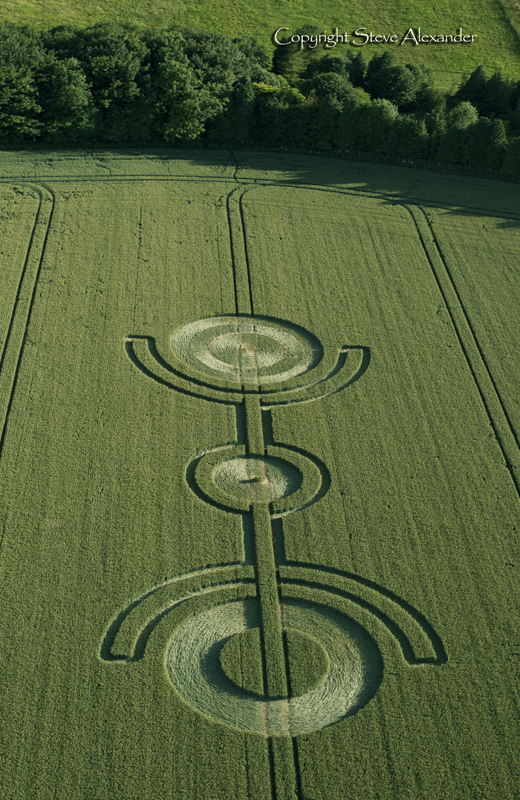 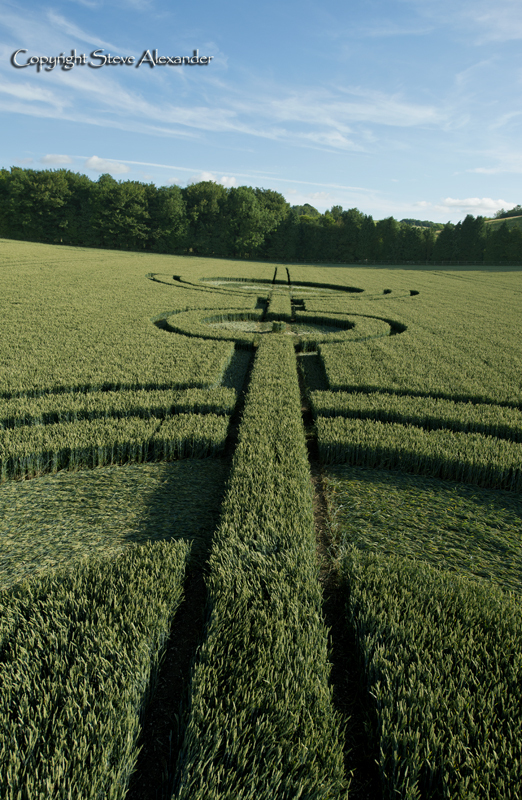 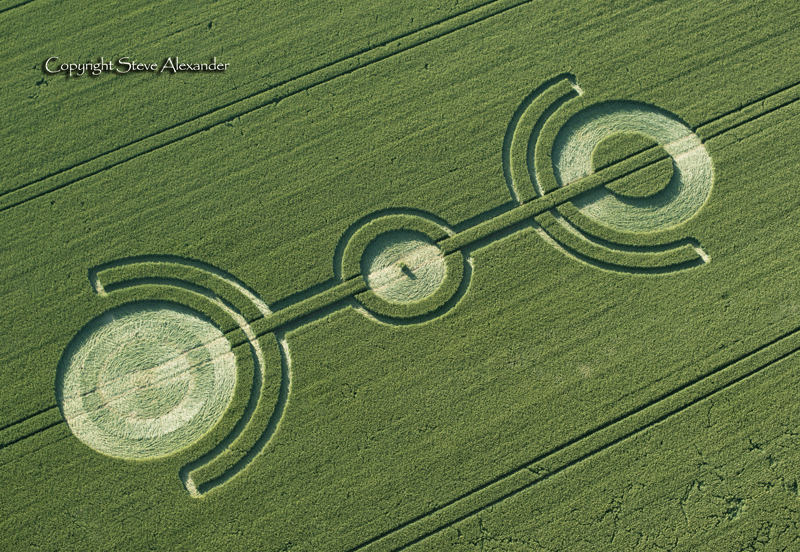 As you look at the crop circle in the field, it looks great and there is absolutely nothing wrong with the design – the tractor lines are integral to the pattern. 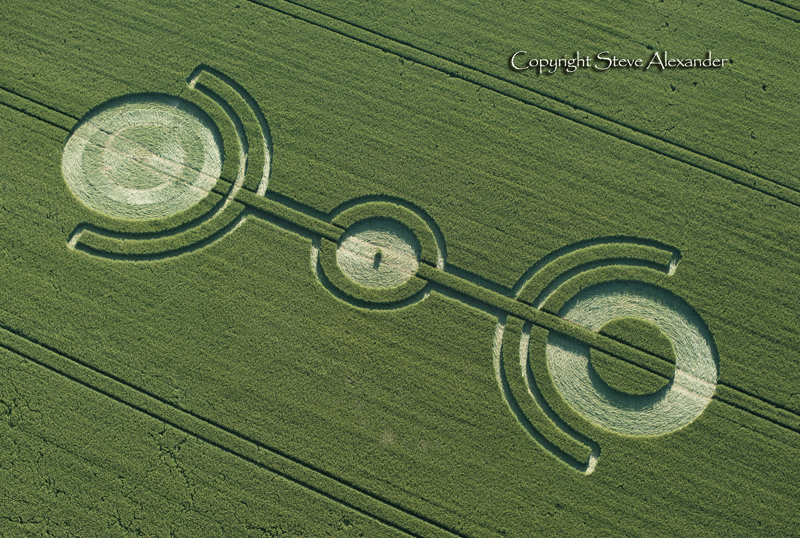 However, when you come to drawing it the question arises as to whether to include the tractor-lines in the image. 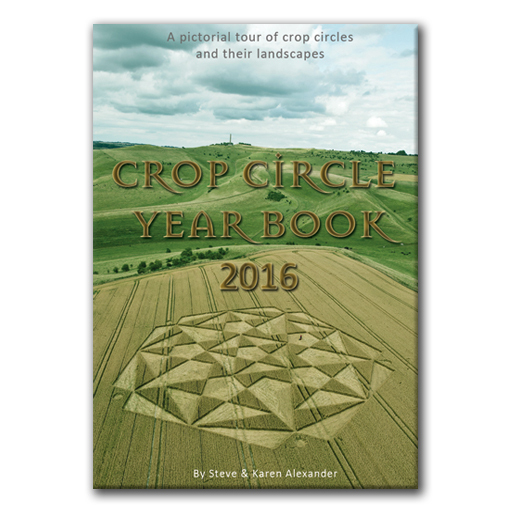 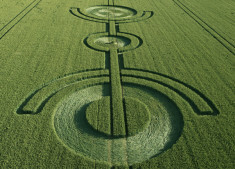 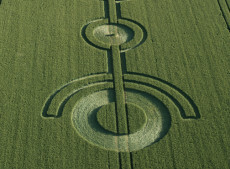 Usually crop circles are a contained system they have a definitive outline which is closed and containing. 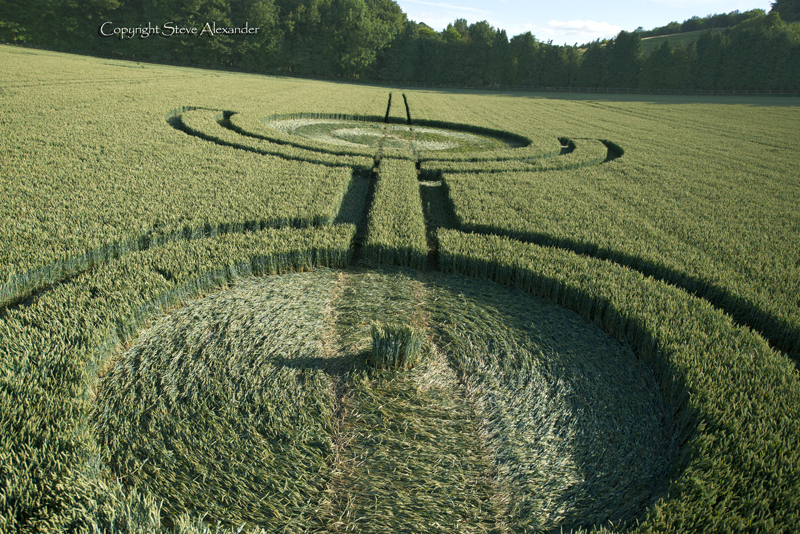 But this does not happen with this circle if the tractor-lines are not included – if you look at Fig. 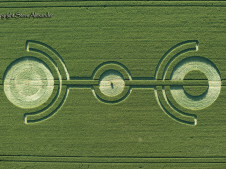 2 below (by Michael Glickman) you will see I have highlighted the area in question in the blue square. 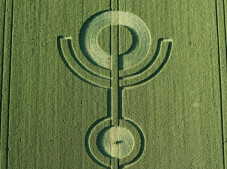 In this area the outline is not continuous, and therefore is not contained, rather it opens out into what would be the surrounding field. 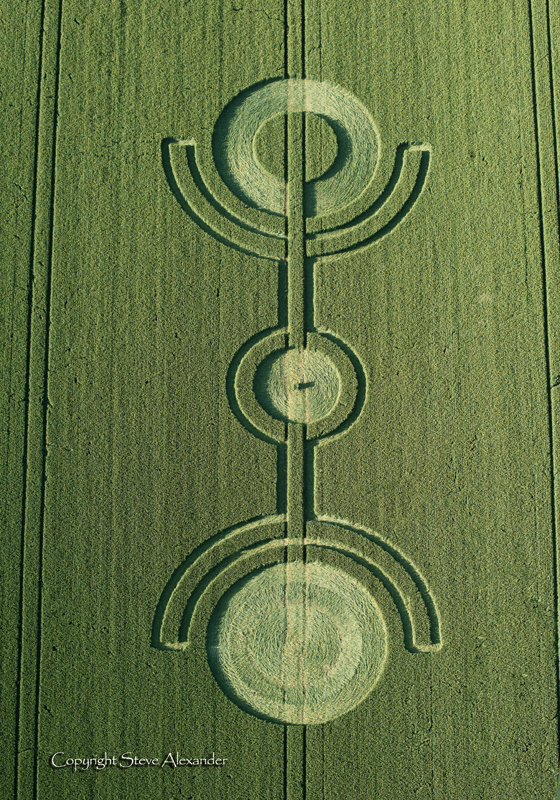 This is unusual. 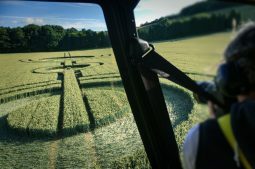 Having said this, if the tractor lines are included the resultant diagram (Fig.3) is equally unsatisfactory, as they travel through the circles at each end of the formation and clearly look out of place. 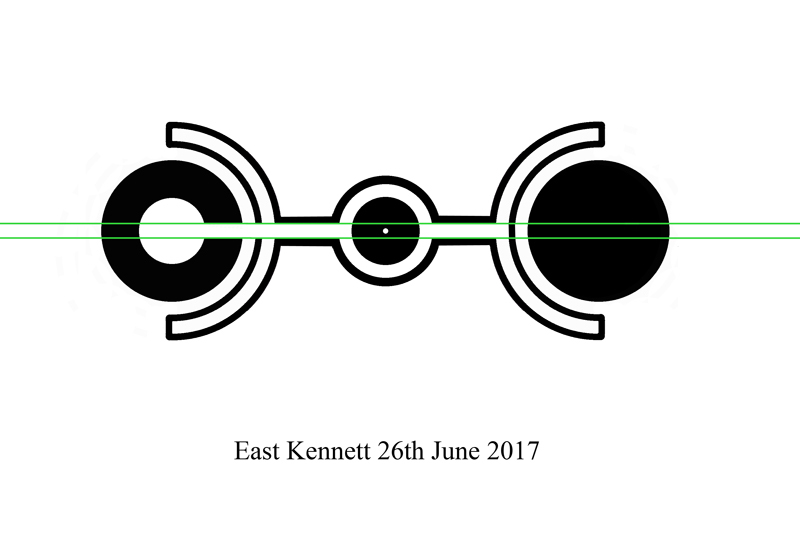 My own solution was to use watercolour to imply the lines of a contained system without specifically drawing the tractor lines in – see what you think. There is a nice Golden Section proportion in the design (see below) no doubt part of the reason we find the design so attractive. 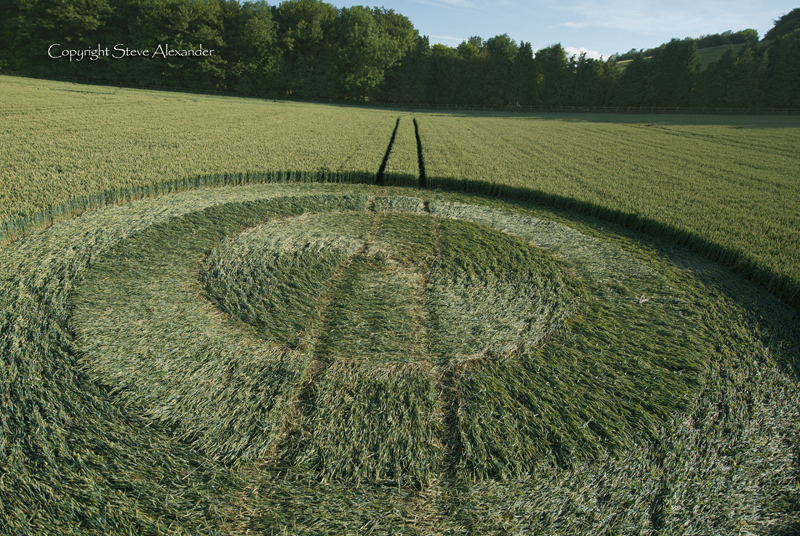 Thanks to Michael Glickman for the use of his images and some stimulating conversations about this formation.